Vinyl Cedar Shake Siding, cozy, comfortable and ruggedly charming. Vinyl Cedar Shake Siding is an exceptional choice to express your love for rustic outdoor look and natural beauty of cedar shakes. All the rugged charm of cedar without the high cost and high maintenance of real wood. What is it? Vinyl cedar shake siding is siding that looks like real cedar wood shakes but made out of vinyl. Much less expensive than real wood and is very maintenance friendly. Never needs painting, termites won't eat it, and can withstand very harsh weather conditions. Click on the picture to see larger version. Generally comes in two basic styles, straight edge and staggered edge. Straight Edge and Staggered Edge. Each style can be ordered with different textures, from smooth to rough cut cedar texture. All sidings come in different profiles. A 'profile' is usually how wide the siding panel is. To learn more about what a 'Profile' is click here. 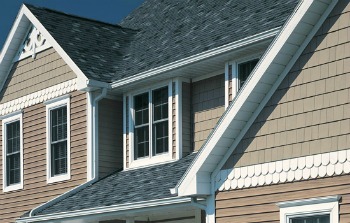 Vinyl Siding Profiles, click here. CertainTeed Cedar Impressions Double 9" Staggered Rough Split Shakes on the top gable of the house. Note how the homeowner has used the vinyl cedar shake siding in combination with natural stone for a truly distinctive look. Note the relatively straight edges on the bottom edge of each panel. This is why they call it Straight Edge. Click here to review more information about CertainTeed Cedar Shake Vinyl Siding. Vinyl Siding prices run around $3 to over $10 per square foot installed. Cedar shake siding will cost you about 20% - 25% more than standard vinyl sidings. To see more information on vinyl siding prices click here. 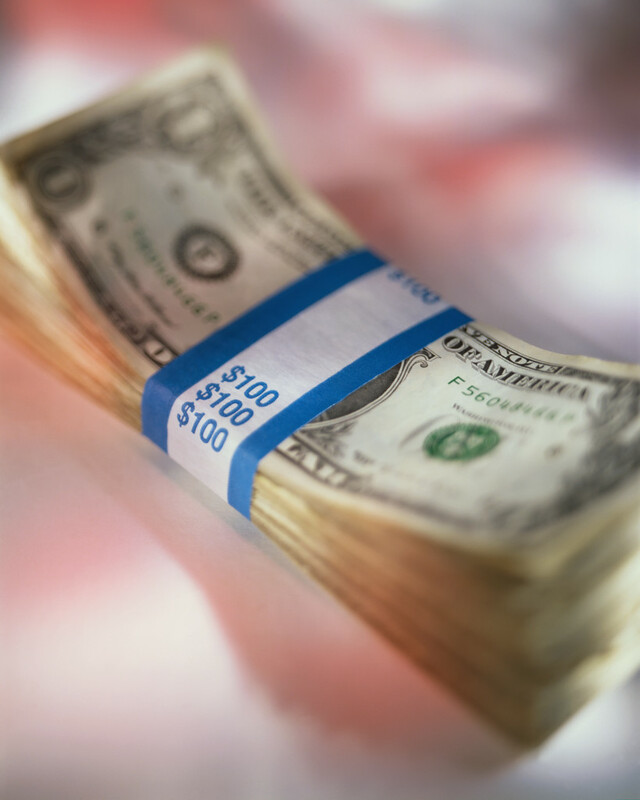 Shake vinyl siding costs a little more than regular vinyl siding. It is usually thicker than regular vinyl siding and much stronger. Because it tends to be a little thicker than regular vinyl siding it has a deeper more realistic wooden texture or look to it. It generally comes with a 50 year warranty. Some brands are up to 1" thick and can take hurricane force winds making it idea for coastal areas or any area where harsh weather is a concern. Remember that the the price of the siding is only one part of the price, the contractor will charge you extra to install it. For more information on cost click here. The most realistic vinyl cedar shake you can buy! Classic elegance with that rugged outdoor look, vinyl cedar shake siding adds an air of distinction to any home. 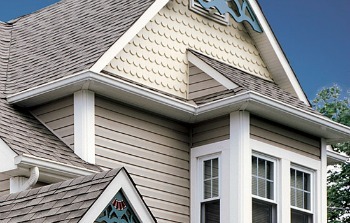 Used in combination with other vinyl siding types it can add the extra elegance to any home. This siding is strong, durable, looks just like real cedar wood siding at about half the cost. It is very low maintenance and never needs painting. Better brands are up to 1 inch thick and have lifetime warranties. It can withstand the harsh winters of the north and the strong sun high wind of coastal areas. To see more information on Foundry cedar vinyl siding products, along with more colors and textures click here. 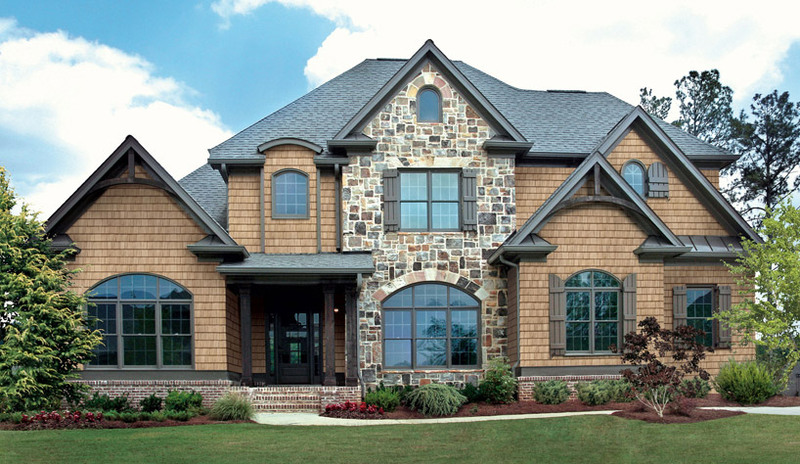 Half Round Shingles work beautifully with all siding styles. It adds a distinctive touch to when used as a trim accent on existing homes. CertainTeed Cedar Impressions 6 1/4" Half Round Shingles used as trim. Adds the extra little difference that creates that very special look. Also it never needs painting! Used here as accent with Cedar Impressions Double 7" Perfection Shingles in Natural Clay color on the gable with Monogram Double 4" Clapboard in Frontier Blend color used on the bottom part of the house. Note how all the window frames and corners are covered making this house virtually maintenance free. No more climbing on ladders to paint second floor trim again. To see more on Trim and Accessories click here. Here CertainTeed Wolverine Restoration Smooth Double 4 1/2" Dutchlap Vinyl Siding in Herringbone Color used as the siding on the main house bottom. On the top gable Cedar Impressions Half-Round siding. Vinyl cedar shake siding can be used in older homes to bring out that freshly restored look without the high cost of real wood. Vinyl shake siding has excellent insulation qualities that will help keep your home warm in the winter and cool in the summer. 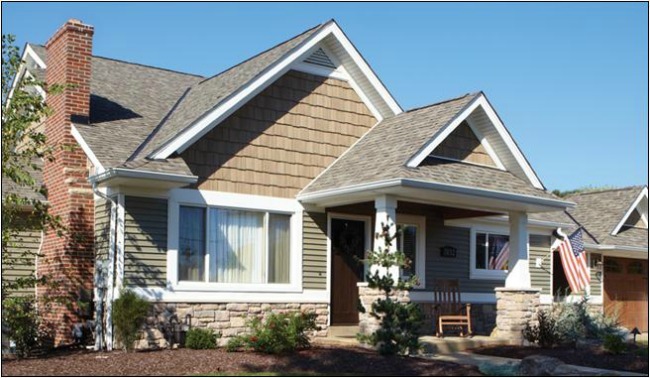 Back to Vinyl Siding Styles.